Home Uncategories Fix it, K-Rod. Just fix it. Fix it, K-Rod. Just fix it. It's the morning after Wednesday's game against the Kansas City Royals, and much of Tigers fandom is still shaking, twitching, or dry heaving after Francisco Rodriguez's ninth inning "save." (It was only a save in the most technical sense of that word.) The rest of us are still hungover after getting Trauma Drunk post-game. Yes, the hard contact is still an issue, which is itself an extension of the fact that Francisco Rodriguez threw a whopping 55 percent of his pitches for balls in Wednesday night's game. The command just wasn't there, and he missed both in and out of the zone. That's a recipe for disaster, and right now K-Rod is getting very, very lucky. Just for fun, I ran a few numbers to see if I could come up with some kind of "Roller Coaster Index" to measure how nervous a closer makes his fanbase. I only looked at situations where: 1) the closer actually notched the save, 2) his team was winning by three runs or fewer, and 3) he got a clean inning to start with. Jose Valverde picked up some saves in 2013, but he put the tying and/or winning runs on base in more than half of those outings. Joe Nathan did that in more than one out of every three games he saved in 2014. It's early in this season to try to apply that criteria to Francisco Rodriguez, but I wanted to see what his 2015 season looked like, and he only got his team into that kind of trouble once every five saves (his save rate was 95 percent that year). Baserunners are a problem if you're trying to close games in the ninth. For the last two consecutive seasons, K-Rod has allowed less than a baserunner per inning, but so far in 2016, he's allowing closer to two baserunners per inning (1.7, after Wednesday). That's not going to cut it, not if this team has aspirations to not only make the postseason, but go deep into October. Just look at the past five years' worth of World Series winners. The 2015 Royals had Wade Davis, the 2014 Giants had Sergio Romo, the 2013 Red Sox had Koji Uehara, the 2012 Giants (again) had Sergio Romo, and the 2011 Cardinals had Jason Motte. Every single one of those closers allowed less than one baserunner per inning (on average) during the regular season. There's a reason why all of those closers looked so dominant -- it was hard enough to get men on base, let alone score runs. The Tigers have not had that in the past five seasons. The closest they came was Joaquin Benoit in 2013, who allowed 1.03 runners per inning. 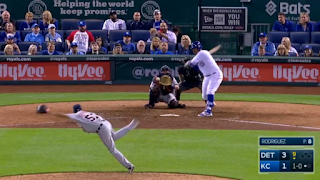 The thing that K-Rod is missing right now is the swings and misses. His nickname indicates his past success as a strikeout master, but he's not getting the K's so far in 2016. Look at that list of World Series closers again: every one of them with the exception of Motte averaged at least one strikeout per inning, and most of them averaged more (Uehara was averaging close to 1.5 strikeouts per inning). In 2015, K-Rod averaged 1.1 strikeouts per inning, but so far this year he's down to half-a-strikeout per inning. Or we can look at swinging strike rates -- what percentage of pitches thrown by a pitcher induced the batter to swing and miss? For Wade Davis in 2015, that was 11.6 percent. For Sergio Romo in 2014 and 2012, it was 14.2 and 15.6 percent, respectively. 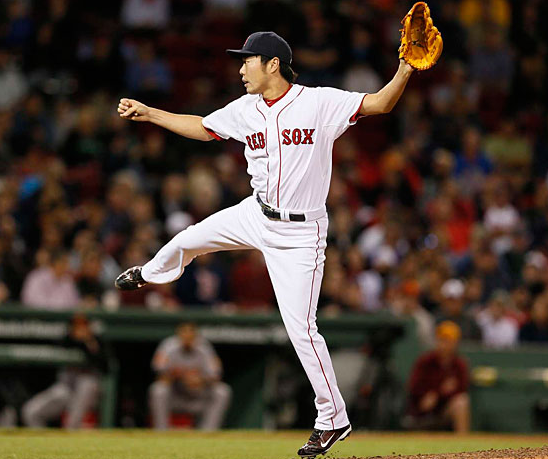 Koji Uehara had an obscene 18.6 swinging strike percentage in 2013. Jason Motte was at 12.1 percent in 2011. K-Rod has seen these kinds of numbers, and very recently. His swinging strike rate was 11.5 percent in 2014, and 14 percent in 2015. He's been every bit as good as Wade Davis and Sergio Romo at getting swings and misses. But so far in 2016, his swing-and-miss rate is a paltry 7 percent. That would have put him in the bottom five for relievers in 2015, and in the bottom ten in 2014. Therein lies the concern. It's not entirely a matter of being able to throw pitches in the strike zone, because he's doing that at a 61 percent clip in 2016. That's Kenley Jansen territory. That's 2014 Pat Neshek territory, when he was striking out a batter per inning and posting a 1.87 ERA. No, K-Rod is hitting the zone just fine overall this season -- he's just not missing very many bats. There's still time to figure it out, and it's still early. K-Rod should throw somewhere around 62-65 innings this year, and he's only thrown about one-tenth of that this season. At the same time, closers pitch in the most critical situations, so there isn't a ton of time to let K-Rod tinker and tweak, not when the AL Central looks like it could be a very tight race, and even four or five blown saves can be the difference between 90 wins and a division title, or 85 wins and no trip to the postseason. The changeup is K-Rod's weapon. A pitch that induced swings and misses 25 percent of the time in 2015 is only getting whiffs 15 percent of the time in 2016. When I spoke with Rich Dubee in January, he said that the pitch he felt most comfortable working with pitchers on was the changeup, so here's hoping that improvement is right around the corner. Just keep looking at those 2015 numbers: more than a strikeout per inning, a 14 percent swing and miss rate overall, a 25 percent whiff rate on the changeup in particular. K-Rod can be dominant again. Keep your fingers crossed.